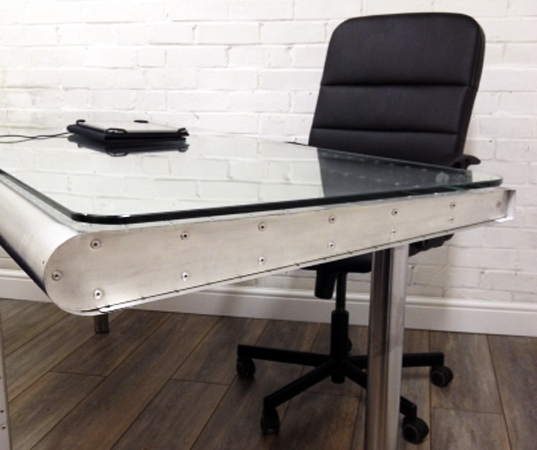 Green designer Max McMurdo has once again put his skills into action to create a fresh new version of his famous ‘Deborah’ airplane wing desk. 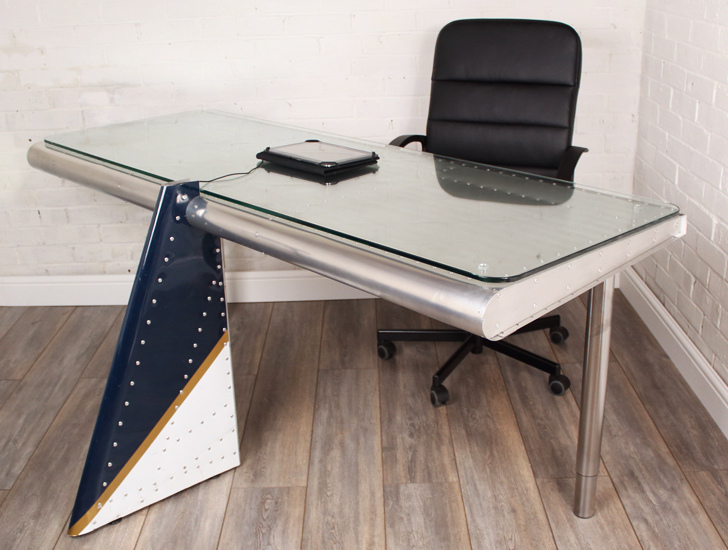 Named after Dragons’ Den star Deborah Meaden, this classic desk is made from real airplane wings which have been transformed by Max’s Bedfordshire-based company, Reestore Ltd. Entirely hand-made in the UK, each Deborah desk is original and crafted from airplane wing panels which are carefully hand riveted into place. As with many of Max’s designs, the Deborah desk can be customized using different colors, and he can even frost your company’s logo or favorite quotes into the glass top. Launched in 2007, the first Deborah desk followed Max’s successful appearance on Channel 4’s Dragons’ Den, where he received funding from Dragons’ Deborah Meaden and Theo Paphitis. Since then Max has developed the design and now this amazing rework gives the appearance of an airplane tail rising through your office floor! Max and his new Deborah desk recently appeared in the Channel 4 television show George Clarkes Amazing Spaces and it will be hitting TV screens again later this year. The Deborah desk is only available from Reestore directly, and prices start at £2250.00. For more information visit www.reestore.com or email Max [at] reestore [dot] com.